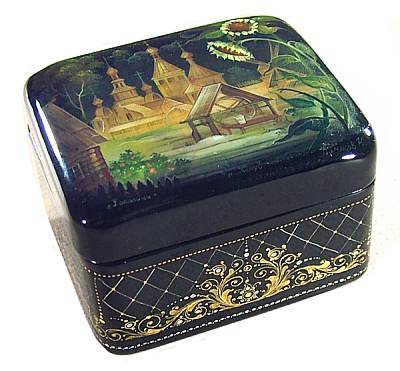 Twilight paints the low clouds behind an elaborate wooden church delicate, sparkling pewter. 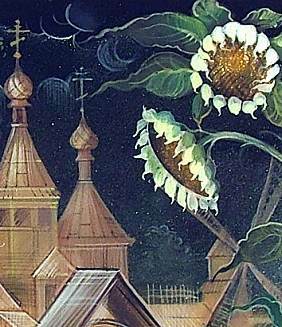 A pair of pale sunflowers nod in welcome, their broad leaves seeming to beckoning travelers to enjoy the cool water of the village well. Tiny pink blossoms pepper the garden of an tidy cottage, adding subtle contrast and lots of charm. 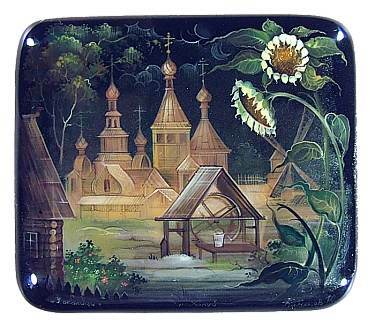 This box is made of high quality papier mache and is signed on the lid with the title, artist's name (Konyakov), and village. There is a hinge at the top, and the interior is red lacquer. It rests on four round legs.